Over the next few years only a handful of breeders obtained Zwartbles sheep. In 1994 Mr Peter Coombs (ZSA No.009) had a stand at Sheep ’94, and by chance a group of Dutch breeders also manned a publicity stand. The reception of these sheep by the public made Peter realise that they had real potential and it was after this that the numbers in the UK really began to increase. The late Geoff Nash and his wife Nancy made contact with as many Zwartbles breeders in the UK as possible and set up the first meeting in October 1995 at the National Sheep Association headquarters in Malvern. Twelve flocks were represented containing about 140 sheep and seven other flock masters sent their apologies. The Zwartbles Sheep Association was born with the aim “To promote the breed and maintain its purity”. Since then it has been a journey of continual growth and development. Twenty seven sheep were presented at the Builth Wells Ram Sale on 23rd September 1996. There was not enough stock for an association sale so an informal gathering on Castle Morton common was the first viewing and sale of sheep. In 1997 the ZSA logo was designed and the first leaflets were produced Mike Sands took on the laborious role of Registrations Officer and developed the A4 pedigree certificate. The first major shows to put on Zwartbles classes were the Royal Welsh, Royal Bath & West and the Great Yorkshire. Everywhere else members were showing in Any Other Breed classes. 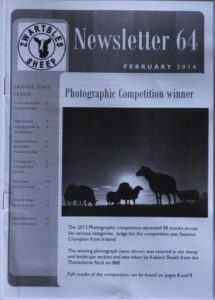 The first website, www.zwartbles.org, was instigated in 1999 and more shows put on specific Zwartbles classes. The development of the breed standard, together with the idea of Category A and Standard categorisation were adopted to raise awareness that it was important for breeders to use the best marked sheep. The ZSA took a stand at Northsheep 2000 and the interest in the North began. By 2001 the number of members had grown to 107 members. As the association continued to grow at a fast pace, it became apparent that the ZSA had to address the problems that more members, more promotion and more sheep to register brought; discussions about a new computer system began. The Grassroots computer system was purchased in 2004 and official sales were held at Exeter (36sheep) and Carlisle (160 sheep) as well as Builth Wells (92 sheep) and Worcester (92 sheep). The ZSA held its 10th anniversary celebrations at the 2005 AGM. At this time there were about 6500 Zwartbles sheep in the UK and membership had risen to 250. It was at this time that the ZSA also employed their first secretary. By 2007 the membership had increased to 360 and it was time to move forward again and so Council decided to centralise the administration of the Association and to employ one person to complete all registrations as well as the secretary’s role. During 2008 the new A5 size pedigree certificate was adopted to replace the original A4 certificate and saw the instigation of regional branches helping to bring together breeders from the same areas for various activities organised and undertaken by regional members. In 2010 a new National Show was held for the first time hosted kindly by the Three Counties show at Malvern and was supported by over 90 entries. The idea being that the national show would stay at Malvern for a time before moving to another major show in another region of the country. In 2012 the website was updated to allow more information to be available for members. 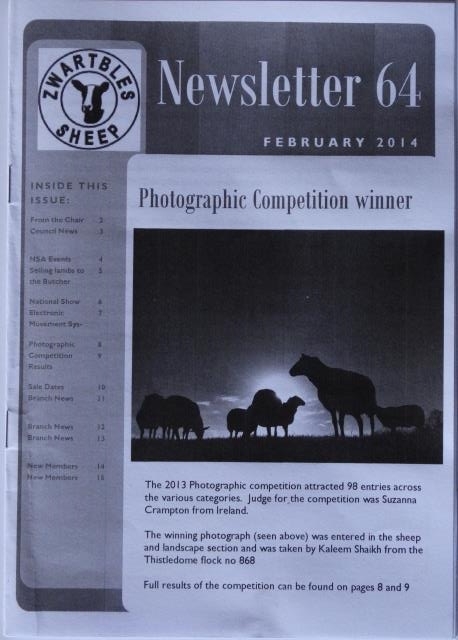 We also saw a new format for the newsletters making them much more attractive and informative. 2013 welcomed our 1000th member – another landmark on our journey. Council also felt that our website was still not fulfilling member’s needs. You are now looking at version 3 of www.zwartbles .org which has been developed to keep up with technology and user demands. As you can see the ZSA is still increasing its membership every month and shows no signs of slowing at present – all pointing to a positive future with our exceptional, elegant sheep.